Speaking of November, for some unknown reason I have finally jumped on the bandwagon for NaBloPoMo (National Blog Posting Month), which is where a ton of bloggers sign up to post every single day in November. That's right. Everyday. I have never signed up before, even though this thing is extremely popular and most bloggers made their first attempt MANY years ago, but I am not a fan of PRESSURE. So I waited until everyone else had done it and it's old news before I decided to give it a go. I AM NOT AN EARLY ADAPTOR. Anyway, expect to see some sort of post from me everyday this month. I am not going to lie, a fair few of them may contain a single picture, BUT THEY WILL BE POSTS! 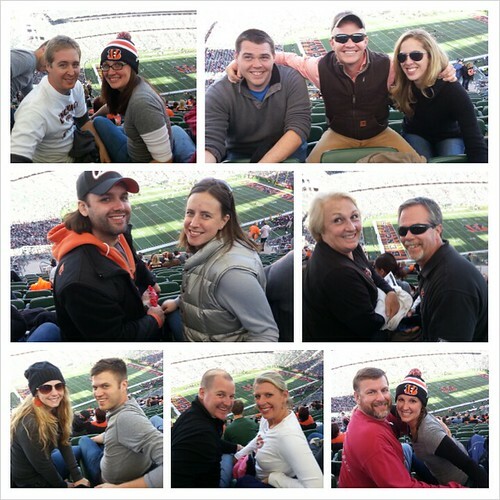 So back in like August when I decided it might be fun to go to a Bengals game for my birthday, I had no idea that, #1 so many people would agree and actually come with me, or #2 that it would turn into a huge birthday weekend explosion. This entire thing somehow went off the rails (IN THE DIRECTION OF AWESOME) from my original "Hey... 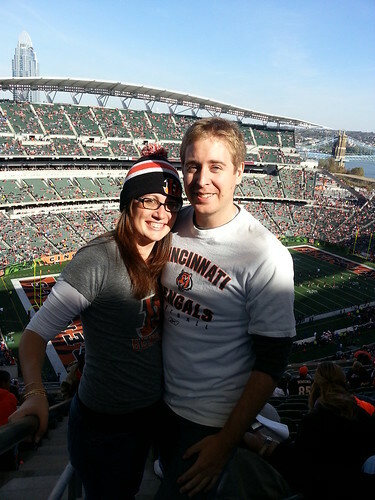 I wonder how much Bengals ticket's cost" thought (sparked by Candice asking how much Bengals tickets cost... credit where credit is due). But the game could not have been more fun, and within the first hour of tailgating we started talking about 'next year' and 'annual tradition' and someone (me) might have discussed getting tshirts made, so yeah.... it was a hit. Okay, we are going to collage some of this out, just to get ALL the excellent pictures in this post...If you really want to see each picture on it's own, just click on any photo and it will take you to my flickr account and you can see them all! 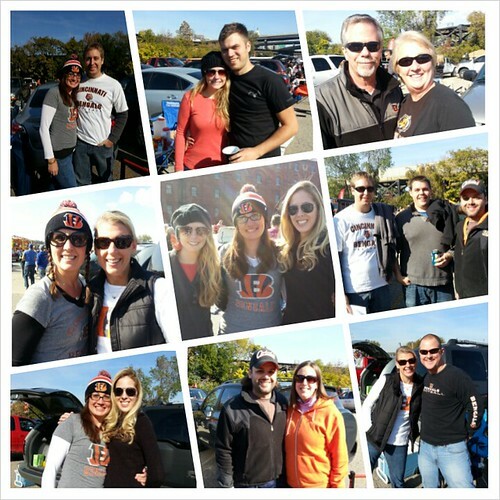 One of the things we did really right this time (we have tailgated for Bengals games in the past) was going early... it seemed weird to meet at 8:30 (cough cough, 9am) for a 4 o'clock game, but having that amount of time to get there, claim a spot, set up, eat and actually enjoy hanging out required that amount of time. 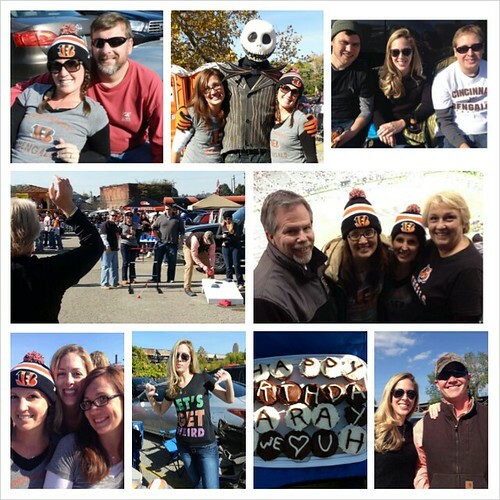 Tailgating... it's an all day commitment. Also key, bring good people.We had a group of 15, which sounds large, but was completely perfect. We brought an insane amount of food and drinks and basically had a huge parking lot party along with the other couple thousand people in our lot. 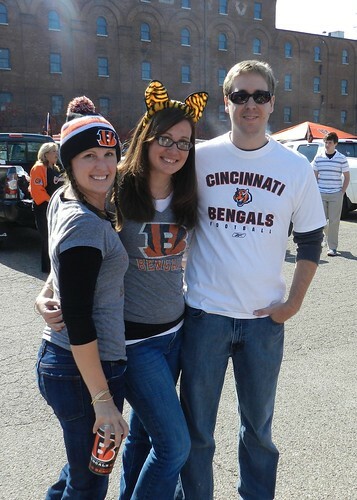 The weather was perfect and I do not think I am exaggerating when I say it was maybe my favorite day of 2013. Thanks to everyone who came along!! I can't wait to do it again next year! !